How do horses travel to the Olympics? Home / Travel News / How do horses travel to the Olympics? The 2016 Summer Olympics kick off in Rio next week, and most of the news stories about the games predict a complete debacle for both the host nation Brazil & the athletes competing. Moving competitors to an event such as the Olympics requires a lot of planning and coordination for humans, but what about the horses that compete with them? An interesting article from the BBC details just how the equestrian athletes will make their way to Rio. If you get fed up waiting in line to board, spare a thought for these horses, for whom the process can take between two and four hours. Why so long? Because this is the crucial part. A “nervy” time, according to Yogi Breisner, eventing performance manager for Team GB. Horses are loaded into stalls on the ground and then levered up into the plane. It’s not uncommon for them to get spooked and any bumps or scrapes are most likely to happen now. After four years of work, much is on the line. Each stall is designed to accommodate three horses but it’s important these Olympians travel in the equine equivalent of business class so Team GB horses fly two to a stall. Some travellers might prefer the space entirely to themselves but the horses are generally happier in pairs, according to British Eventing team vet Liz Brown. Here is video from WHDH of the horses being loaded up for their long journey from England. 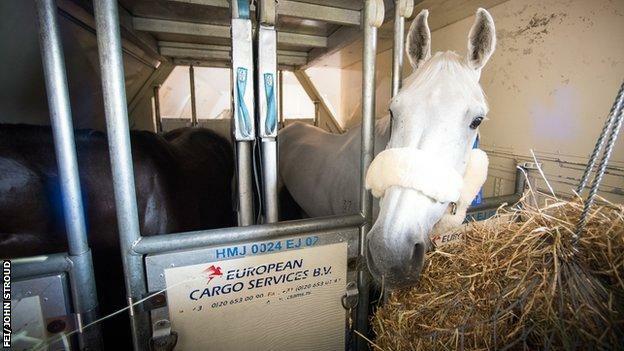 Those are just are some of the highlights, but the whole piece is worth a read to see all of the detail that goes into making sure the horses are happy & healthy during the 12 hour, 5,791 mile flight from London to Rio De Janeiro. At the very least, they won’t get mugged, unlike the poor Chinese athlete who had someone vomit all over him and then steal all of his belongings on his first day in Brazil.